While its very obvious ‘Tyre’ glue is intended for model cars, this super glue has other uses also. It can form a impact and vibration resistant joint that will stand up to 250° F heat. 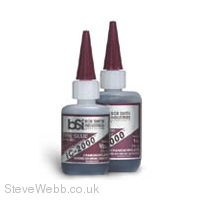 This glue seals well and has been used to bond other rubber items in place such as o rings and repairs to shoes etc.